Omeka condemned Okorocha for “arbitrarily sacking a duly elected administration” in 2011 and failing since then to conduct LGA elections to replace the sacked chairmen and councilors. This grandpa is angry with Governor Rochas Okorocha of Imo State. Who knows how far an elder's anger can go. 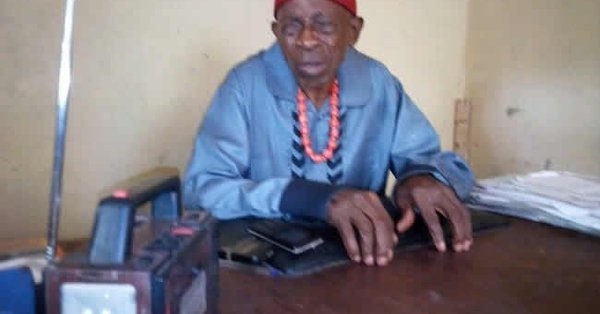 The nonagenarian, Pa Conleth Omeka, is very angry with Okorocha for failing to conduct local government elections since he took office 7 years ago. He has now lost his patience and threatens to lead a statewide protest if Okorocha fails to conduct council election in two months’ time. Pa Omeka who is blind said there was no need for general elections in the state if, for seven years, Okorocha had “vehemently refused” to conduct LGA elections. At a press briefing on Tuesday, Pa Omeka, who is the national coordinator of Nigeria Patriots Pioneers Liberation Movement, said the absence of democratically elected chairmen and councils was “spreading hunger and poverty in Imo State". “We sincerely call on President Muhammadu Buhari and National Assembly to take urgent steps to review and amend the section of the Constitution that empowers governors to dissolve and run affairs of the councils as their personal empire and to grant the 774 local government areas full autonomy," Omeka said. He condemned Okorocha for “arbitrarily sacking a duly elected administration" in 2011 and also for having failed since then to conduct LGA elections to replace the sacked chairmen and councilors. How bad things have become in Nigeria has continued to show daily.